The coverage of the autoharp on this page (for that matter, at this site) follows only the direct manufacturing successors of the autoharp's first American producer, C.F. Zimmermann. Other American companies have at least sold autoharps throughout the time since Zimmermann began production, and perhaps some actually manufactured the instruments they sold. In addition to this page, this site's coverage of the autoharp consists of two companion pages. For a close-up look at the features of 19th century autoharps, consult the Features Page. Besides offering a look at the details of early autoharp features, the page also contains images of the entire first line of autoharps produced in America by C.F. Zimmermann's Philadelphia shop which date from the period 1885-88. And for a broader look at the 19th century autoharp, visit the Autoharp Gallery Page. The Gallery features images of nearly every 19th century model produced, as well as stringing and configuration specs. It appears that the autoharp may have been invented not in America but in Germany. For a detailed account of the facts behind this statement, read "The True History of the Autoharp" by Ivan Stiles. The article cites the earliest known patent for the instrument now known as the autoharp, a British patent granted to a German inventor. An incredible amount of effort lies behind the research that resulted in this concise article. Hats off to Ivan for doing the digging and to the Autoharp Quarterly site for making his findings available online. The first line of autoharps produced in America consisted of at least three styles, the 3-, 4-, and 5-bar models with plain bars. One early catalog shows only these models. Whether this was an abbreviated catalog or if it represented the entire line is not known. Within the first three years of production, if not from the beginning, the line included one 4-bar model with "shifter" bars, two 5-bar "shifter" models, and a 6-bar "shifter" model. These instruments were made in Philadelphia, in the shop of German-born American C.F. Zimmermann, who in 1882 obtained an American patent for an attachment gizmo he proclaimed constituted "an improved method for playing a harp". The total package, a zither-or harp-like instrument outfitted with this gizmo, was referred to as an "autoharp". However, both the instrument and more importantly the bar action pictured and described in the patent differ significantly in form from the autoharp as we know it. The body shape is symmetrical, and the felt-bearing bars that silence certain strings move horizontally, rather than vertically (see illustrations in article cited above). * Zimmermann's 1882 patent did not represent the instrument now known as an autoharp. *The patent grantee was German, the patent was British; it seems likely that an earlier patent was granted in his home country, but as the article explains, it is very unlikely that any record of it will ever be found. So how do we get from Zimmermann being granted a patent for an instrument that is not the autoharp as we know it (1882) to Zimmermann beginning production of the autoharp as we know it (c. 1885), for which a British patent had been granted to a German inventor in 1883 or 1884? Both the German instrument and the one featured in Zimmermann’s patent are small zither-type instruments which make chords by muting certain strings, and which do so by means of manipulating wooden bars with blocks of felt attached to them. It appears that Zimmermann saw the German instrument before he applied for the 1882 patent. Otherwise, we have to believe that two such instruments were invented independently of each other and within a couple of years apart in the course of all history. It seems certain that the action of the instrument in Zimmermann’s patent would have been functionally inferior to that of the German instrument. In the years from 1882, when the first patent was granted, to about 1885, when production actually began, it seems likely that Zimmermann realized his patent instrument was a failure, that he experimented with trying to improve on it, but that he eventually gave up and began production of the German instrument in unaltered form before some other enterprising American did. However, it appears he was reluctant to totally abandon his horizontal approach to muting strings and that he had also experimented with incorporating the idea into the design of the German instrument as an improvement. The result was the addition of "shifters" to the chord bars. These shifters allow each chord bar to produce more than one chord. They do so by means of manipulating metal tabs attached to the bars, which cause a separate set of felt blocks to move horizontally, muting and un-muting certain strings. The shifters appeared very early on; examples of all shifter bar models bearing appointments of the very first type are known. This suggests that Zimermann's experiments with them probably began sometime before the commencement of American autoharp production. Around 1893, the autoharp factory moved to Dolgeville, New York. It was bought by Alfred Dolge, another German-born American who had established himself as a piano parts manufacturer, beginning under the tutlelage of Frederick Mathushek (yet another German-born American) in New Haven, Connecticut. It was at the Dolgeville factory that the autoharp first donned its now-familiar cloak of black. The Philadelphia location had been a productive one; a booklet from around 1889 states that "50,000 have been sold in the first three years following its introduction". The autoharp's second home, the Dolgeville factory, was even more productive. As a result, 19th century instruments are abundant enough that examples in fine structural, functional, and cosmetic condition are still to be found. By way of example, here is a Dolgeville No. 2 3/4 from the 1890s, after proper cleaning and new strings. Some of the most imaginitive decals ever to adorn autoharps were of Dolgeville birth, and the firm reached the height of functional refinement for the time with the "concert grand" and "parlor grand" models. Though extremely productive, the company enjoyed a very short lifespan of only about 6 years. Undaunted, Dolge relocated to California, and by the time he published his amazingly informative Pianos and Their Makers in 1911, we find him re-established and for all appearances once again thriving as a piano parts manufacturer. Beginning around 1910, the Phonoharp Company of East Boston began manufacturing the autoharp. The company originally produced an instrument patented in 1891 called the Phonoharp, became established later in the 1890s as the producer of the Columbia chord-zither, and in the 1920s produced the Bosstone ukelin. The Phonoharp Company also produced the Marxophone and the Celestaphone. As far as I know, the Phonoharp Company introduced nothing new, functionally, to the autoharp, but only produced some of the pre-existing models that had been pioneered at Philadelphia and Dolgeville. However, the company did leave its mark in the ornamentation category. 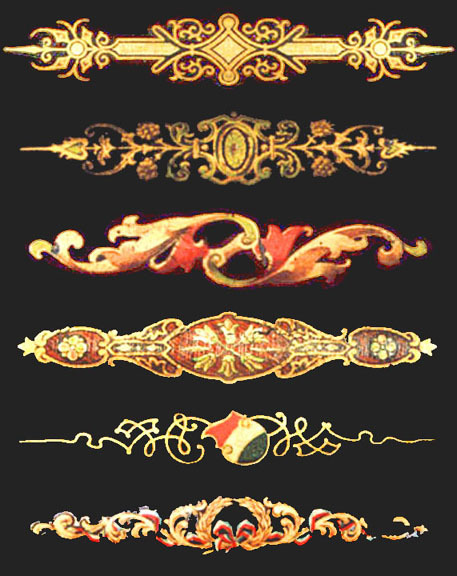 The Phonoharp Company's tail cover decals were the most imaginitive and elaborate of any company that produced autoharps. The same decals also adorned the tail covers of their chord-zithers. A few are shown. For a short time in the late 1920s, autoharps bore the name of the International Musical Corporation of Hoboken, NJ. The company's name appears on the labels of zithers and most of all ukelins. It appears that all their instruments were actually made at Oscar Schmidt's Jersey City factory. Sometime in the 1930s, the company was absorbed by Schmidt (see below). Finally, around the mid to late 1920s, we arrive at the best-known of the autoharp mass-producers, the Oscar Schmidt companies. Schmidt (and later, his successors) had affiliations with an army of "companies". Some were generic company names like "Manufacturers Advertising Company". Some were partnerships, one of the more notable being "Menzenhauer and Schmidt". (Menzenhauer was the holder of the original 1894 patent for the chord-zither. This relationship apparently originated around the turn of the 20th century.) Some of the Schmidt "companies" were even named after the particular instrument they produced, such as "The Hawaiian Art Violin Company". There were also business activities outside the realm of pin-tuned instruments; Schmidt's company produced guitars, and probably other instruments as well. It appears that sometime in the 1920s, all the manufacturing firms producing zithers, ukelins, and the like (with the exception of the Marx company) folded into Oscar Schmidt companies. Sometime in the 1930s, International Musical Corporation was swallowed by Schmidt. That company's name was retained in part, and the company names that resulted were "OS-International Corp." and later "OS-International, Inc.". The company continued to produce ukelins until the 1960s, chord-zithers into the 1970s, and as far as I know, autoharps which at least bear the OS name are still being manufactured to this day. In the time from about 1960 to the present, the company has introduced many new models.